PR (Public relation) is a tough and intense job which requires skills and qualities because a lot depends on the PR. Public relations person normally does the job of promoting and creating a relationship that helps their employer and keeps up their public reputation. The globalisation has created a global market where you need to be on the top of your game to succeed and effective public relations PR helps in attaining those goals by establishing good image and reputation in the market and helping in creating the image that suits your requirements. Hiring the right PR person is not easiest of the job, but first thing is what makes a good PR Person. What Makes a Good Public Relations Person? People often misunderstood the job of a Public relations person because of the tasks they do and several public relations duties they have, also not all the duties are described in the job description. A good PR not only maintains a good public image and relation but also looks after PR marketing and PR advertising because they too participate in PR. The big question is what makes a good PR person? A PR person needs both human and professional skills to become a good PR person because a balanced combination of human and professional skills is what makes the ideal PR person. Personal skills may differ from person to person, but professional skills are a must because no Public relations person can work without professional skills. Personal skills are always the one that plays a major role in the overall goodness of a PR person because professional skills are easy to develop, but the personal skills came from self-understanding, adaptation and love for the job. Personal skills that help in making a good PR person are patience, congeniality, and thirst for knowledge. Patience and congeniality help a PR person to deal with various situations that may occur and to think clearly when the pressure is high. Personal skills are vital in making a good PR person because PR is the job that needs personal skills at all the level of the job. A PR person is never good enough without the professional skills. PR needs to work effectively and efficiently and that only happens if the PR person has qualifications and skills to do the job. The Professional skills of a PR person include creative writing, ability to speak in public under pressure, effective delivery of words and understanding of various scenarios and the demands of the market. Professional skills can be earned through years of experience and public relations degrees and diplomas, which give some more correct idea of the job and what one should expect from the job. Professional skills are the one that truly makes a good PR person because the job of a PR is highly demanding and needs professional skills at every step. A great PR pro is not someone that exists with ordinary skills, they have some qualities that a usual PR never has. A great PR Pro always knows what to say, how to say, what story needs highlighting and which need to tone down. Good qualities in a person that make them great and set aside from the usual PR which acclaim to be great, but in reality, they are far from greatness. The qualities of great PR pro are. A great PR pro is always ready to take the challenge head on. The job of PR is demanding and requires PR pro to be always ready because no one knows when the opportunity presents itself. One never knows when prominent contacts will be made or an unscripted snapshot of PR gold may happen. So a great PR pro always stays alerted and ready for any news and update about the business world. Creativity is what makes a great PR pro because a great PR pro knows how to change the thoughts of a customer into something great that fulfils the need of the customer and look unique to the others. Creativity is one of the best qualities of a person that each PR expert expected to prevail in this aggressive world where PR pro does everything conceivable to carry out the occupation. Great storyteller changes a boring, uninterested story into something that draws the attention of people and remains easy on the mind so that people remember it even after another story assumes control. Great storytelling is another quality of great PR since they have to recount the story in a way that looks intriguing and draw consideration. Public relations officer must have the capacity to carry out more than finding the fascinating story and let them know well, they must have the ability to offer the story. A great PR pro can characterise a story, write it and compose it to present in the way that news officials and agencies lift it up and disperse it to a more extensive group of onlookers. Convincing abilities are always one of the best qualities of a great PR pro. A great PR pro is always aware of the changes and the demands of the market. PR pro always stays updated with the latest trend, market analysis, and the demand supply chain so that they can deliver most effective results to their clients. PR pro who doesn’t have a thirst for the knowledge can never be the best. A great PR pro always has time for knowledge and curiosity to know more. The best PR pros are those who grasp the latest news, technology, and strategies with an open mind and make them. Public relation careers is a growing industry and every year many fresh graduates choose this field as a career path. Celebrities, politicians, sports person, companies and other famous people and organisations are hiring PR agencies and people to manage their PR because, in the world of globalisation, public image matters the most. The common and successful public relations PR pros that make them succeed and help in achieving positive results of their hard work are. Communication skills are one of the most important characteristics of successful PR pro because communication is one of the greatest PR tools. A great strategic communication always gives positive results and a successful PR pro knows how to use the tool of communication in their favour. Great communication and public relations skills are always needed in PR to use in different situation. A successful PR pro never shies away from the latest technologies, innovations, methods and strategies. Eagerness to learn is one of the characteristics of successful PR pro because they need to be on top of their game if they want the PR of their client to be as good as their client want. The competitive nature of market demands best of you always and that applies on PR pro as well. PR pro interacts with the media on the regular intervals to keep up good PR of their respective clients and customers. Successful PR pro knows the importance of media and keeps up a good friendly relationship. Media relations friendly is another characteristic of successful PR pro because in the world of internet and social media PR pro’s can’t afford to ignore the media. Globalisation has made sharing information as easiest of the task and every single information criticises so many times that each detail plays a very important role. Successful PR pros have very sharp attention on details because a small detail can do so much good or bad in just one go. A decent PR individual associates the customer’s item thought, cause, and key message to the groups of onlookers they look to reach. Creativity is one of the important tools of successful PR pro which they use to draw the attention of onlookers and create good PR for the client. A Public relations person must have the high tolerance ability because of the work and the pressure. A PR person is the first who takes all the impact of the good decision and bad decision and do the damage control when it is necessary. PR pros need to be thick skinned because of the nature of their work, otherwise, they will not take the decision that is needed to be taken. Public relation is a growing field and the predictions are that growth of public relation is going to increase in coming years because of the importance people gives to the PR and the impact of globalisation on the market. People associate with the image first and image plays an important role in the world of internet and social media, that’s why there are many opportunities in PR. The salary of a PR person depends on the experience and several years they are working in the market. The salary also differs from a person who associates with the PR firm to a person who gives his services individually. The average salary of public relations specialist is $55680 however, top 10% of specialist earns $105720 and bottom 10% of specialist earns $31190. Hiring right PR person is always a tedious job because not only the person is important for the PR but the money was given as salary is also important. So the question is how to hire the right PR person? There is no rule book for hiring right PR person, but we are enlisting some of the basic PR tips and points one should keep in mind while hiring a new PR person. 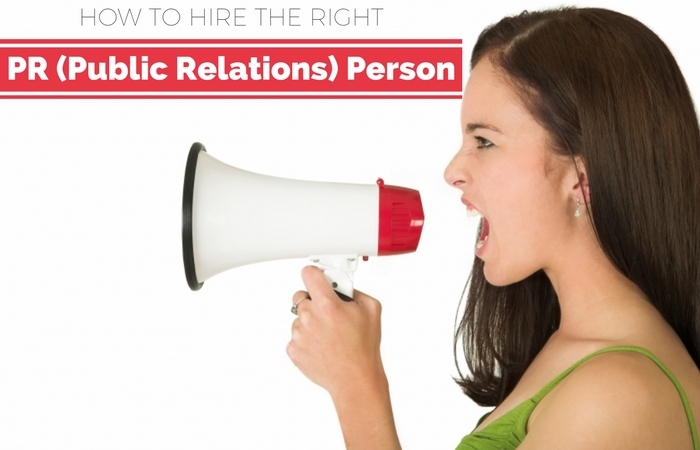 The first step towards hiring the right Public Relations person is to know the needs. Ask yourself what is the need of PR person and when you get the answer then analyse it thoroughly. The need of PR person may depend on various factors and on the nature of the business, so first know the need and why you need a PR professional to do the task and not some employee from the HR. Job description plays important role in hiring process. When a job is published for the hiring process, recruiters get many resumes, but to receive the resumes of those candidates who fit your job write a correct job description. Hiring a wrong candidate causes many problems and create a vicious cycle which causes many issues, including waste of money and time. To hire the best candidate for the job always interview beyond the resume. A résumé contains limited information, but a good interviewer asks questions that check the ability of the interviewees and how capable the candidate is for the job. Choose practical scenarios to understand the candidate and hire the one who perfectly fits the job description as well as fulfil the entire need. Public relations person requires a lot of information to keep up good PR but the information should be correct so that he can use that for the PR. PR person uses information for future reference and to understand the nature of your need as well as to create a positive background. Before hiring a PR person, be ready to share information with the PR person because ultimately their work depends on the information you are sharing. A right PR can do a wonderful job for anyone who hires a PR person to keep up their public relation. Public relations jobs are one of those booming industry mainly because of globalisation and the internet which helps in so many ways especially in generating thousands of the jobs. It is important to hire the right candidate for the jobs in public relation because there is so much on the stack when Public relations person is hired. We hope this article helps you in understanding the concept.